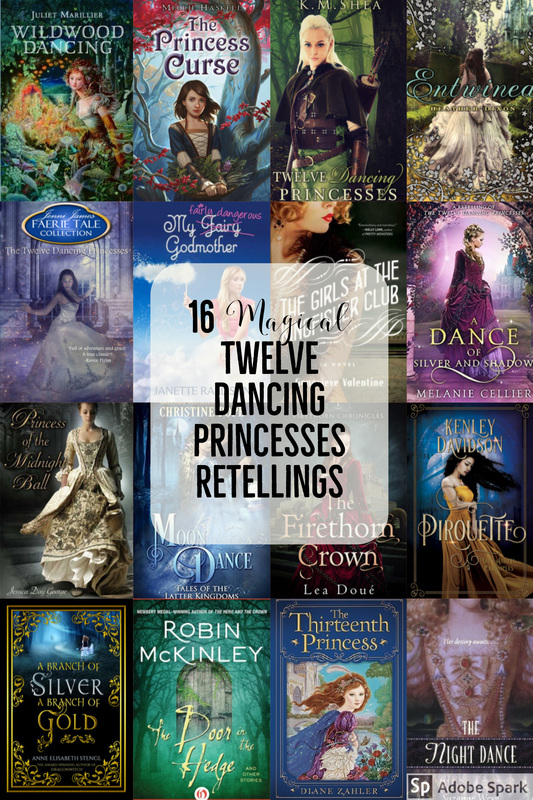 Though The Twelve Dancing Princesses is not as popular as the many fairy tales Disney has adapted, it’s still a better known fairy tale and has quite a few adaptions–both in book and movie format! Today I thought it would be fun to take a look at some of them, and the differences between the stories. It’s surprisingly quite long–though most of them are indie published and not traditionally published. The Twelve Dancing Princesses: By K. M. Shea–that’s me, and yes this is a shameless plug: My version has a lot of battles and magical fights in addition to witty banter, elves, sweet romance, and more! If you’re a fan of Tamora Pierce or Sarah J Maas, this retelling is going to be right up your alley. The Princess Curse: By Merrie Haskell: This is undoubtedly the funniest–and in my opinion, the best–retelling of the original fairy tale ever! It’s very light on the romance due to the main character’s age and leaves you still wanting more when it’s done, but it presents a traditional melding of the two different versions of the 12 dancing princesses that are most known today. Seriously, you need to read it!! Princess of the Midnight Ball: By Jessica Day George: This book is from the perspective of both the princess and the soldier–which is always a plus–and to make it even better, the soldier is not the typical hero (he knits) which makes him really interesting! Additionally, The villain has a different motive that really stands out from the rest of the pack as well. Pirouette: by Kenley Davidson: Kenlely’s work always has amazing romance, but I think this book of hers uses some especially masterful plot-twists. It’s the third book in a series, The Andari Chronicles, but the books are all stand alone so you can read it without knowing anything about the two previous books. The Firethorn Crown: by Lea Douge: This is another YA retelling, but it focuses more on the sisters’ relationship than many of the books I’ve listed above. The way the curse ends up coming down on the girls is very interesting, and the series is set up so you follow the younger sisters on to new adventures once this book is finished. Other retellings that I have not read–so I can’t vouch for them–but I know they exist: A Branch of Silver a Branch of Gold–by Anne Elisabeth Stengl; Moon Dance–by Christine Pope; and The Twelve Dancing Princesses–by Jenni James. I have read A Branch of Silver A Branch of Gold by Anne Elisabeth Stengl. I enjoy all her work, and while you do not need to read anything else of hers before this one, a person might find it helpful. I’m trying to think of how to describe the setting of it and while I hate to use the word “primitive”, there is a certain raw wildness to the world it happens in. Her variation has the right amount of adventure, ominous foreboding at times, effort, and sacrifice to make this a really enjoyable retelling. Ooooh and need I say your rendition was amazing and my favourite so far. I love the Twelve Princesses story – full of gorgeous dresses and mystery with so much scope for interesting plots. 😀 Can’t wait to delve into the others!! Oooooh what a great list!! Haven’t read most of these. Moon Dance by Christine Pope started promisingly but stalled a lot through most of the middle – just a bit boring for a huge chunk of the book, as I remember. Some of her books are better than others, and not all of them are clean. Midnight Masquerade by Marcia Lynn McClure. It’s written well with a few twists and is kind of like an older movie. Very sweet very satisfying story. I /love/ The Princess Curse, and Princess of the Midnight Ball. They are both awesome. Princess Curse I actally own on Kindle, and I love it for its humor and the opening it has into another book. And Princess of the Midnight Ball is great because it is really funny and also incorporates little details of the original story into it, like the fake snoring and the use of a sponge to hide the fact that MC hadn’t drunk the wine. This is one of my favorite for retellings, and I have read most of, if not all, of these. One retelling I would add is Janette Rallison’s My Fairly Dangerous Godmother. Basically not so helpful fairy godmother in training drops the main character first in the tale of the little mermaid, and then in twelve dancing princesses as one of the princesses. It’s very humorous. “The Night Dance” by Suzanne Weyn! It’s one of my favorite books from the “Once Upon a Time” series of retellings. An interesting twist, I think, in this story is that the soldier trying to solve the mystery is Bedivere from Camelot! He’s traveling in search of the lake to return Excalibur after the fall of Camelot (at least that’s how I remember it, I haven’t read the book in years). This is a great series to check out if you love retellings of fairy tails. I know I have probably said this before, but the whole Melanie Cellier series of retold Fairy Tales is fantastic. Not just the one mentioned above. Like Kitty, she does a fabulous retelling that keeps you reading and wanting to get to the next book. They are also all clean romances and I believe are also all in Kindle Unlimited. She is a must read!! Omg! I love how you included intwined and princess of the midnight ball. 10/10 would recommend. The princesses aren’t spoiled, in fact they’re dirt poor, and the stories are enticing. Also, princess of the midnight ball is like yours in that it has both people. Thanks for putting down some of my favorites! I love your retelling of the story, but I also really liked Entwined as well. But the Firethorn Crown is definitely not of my favorites. That series is kind of ridiculous with some of the stuff that happens. It was one of my favorite fairy tales as a kid. Purely for the dressing up I’m sure. Wildwood Dancing is a good rendition. But be careful with Juliet Marillier. Some of her stuff is not only not clean, but pretty dark as well (her version of the Wild Swans story, for instance – rather depressing). Ah yes, I should have pointed out that Wildwood Dancing is one of her very few YA works. Her adult fiction is darker (but still good, IMO). I adore this one! Thanks for adding it to the list. The Night Dance by Suzanne Weyn is fantastic – it ties in Arthurian legend for all you Britt fans! It isn’t a 12 dancing princesses story, but does anyone know the title of a (very loose) re-telling of beauty and the beast where a princess runs away from her strict father to meet her mother’s family (whom she thinks is dead but is actually just being held hostage by an evil relative). She meets up with the rebel leader/prince in the woods where they get to know each other/fall in love before she heads to the capitol to meet mom/incite rebellion. I know it’s the second book in a series where the first book has a seamstress Cinderella and the third book a Snow White who meets the fey. Thanks for the help! I’ve been wanting to re-read, but haven’t been able to find it again on Amazon. The Night Dance by Suzanne Weyn was a two star version. It was the worst I have ever read. That author is terrible.